Seasoned Maltese heavy metal maestro Albert Bell sounds the clarion of battle once more with his third declaration of war in the SACRO SANCTUS Templar trilogy! "Liber III: Codex Templarum" focuses on the Order of 13's fate following their coerced dissolution including their alleged involvement in insurrections against despotic rule in Scotland and the Alpine lands in the 14th century, and the Knights' links with various secret societies. Templar myth and historical facts are combined to masterful effect again as Albert unleashes riff upon riff of feral old school blackened heavy metal forged from a cauldron of pedigree influences from CELTIC FROST to SAINT VITUS, to MOTORHEAD, BATHORY and VENOM. Handling the vocals, bass and rhythm guitar, Albert was this time joined by drummer Steve Lombardo and guitarist Owen Grech, one of the island's most talented shredders. The band continues to successfully tread along the true footprint of the genre with all its best ingredients meshed in a chalice of metalized blood that should satiate the thirst of elite metal aficionados. 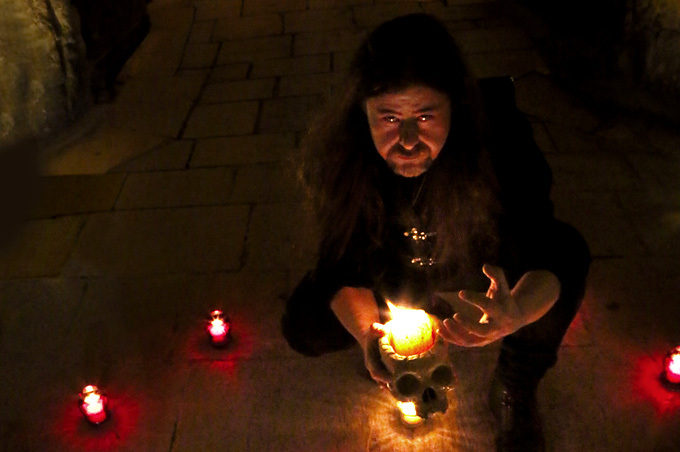 Born in 1967, Albert Bell is one of Malta's most prolific heavy metal musicians and a life-long heavy metal fan. He formed his first band EXORCIST in the early '80s with the vision of emulating the bands from the time, which captured his imagination early on in his heavy metal trajectory - from the trailblazing sounds of Black Sabbath to NWOBHM and early thrash metal. The band underwent various line-up changes until Albert teamed up with the Rizzo brothers and Karl Fiorini in 1986. Together, and then under the new moniker KREMATION (the band decided to change their name after coming across the notorious "Nightmare Theatre" album by the US band with the same name), Albert and co released the band's debut and only full-length cassette album release "Guardians of the Realm" in 1987. The album was possibly the first underground metal release from Malta, and from those early days Albert signaled his intentions to export Maltese metal far beyond the Island's shores and insularity. Following Kremation's untimely demise, Albert joined Malta's seminal thrashers VANDALS on bass in 1989 until in search of like-minded souls interested in pursuing the path of true doom metal (a genre that he had become increasingly more passionate about with the passage of time), he helped to found FORSAKEN in 1991. Even though he originally intended this as a brief stint to assist Leo, Simeon and co in their upcoming gig in September 1991, Albert joined the ranks of the band, at that time named BLIND ALLEY, permanently. Shortly after his recruitment, the band started writing new songs in the epic doom direction, shed the traditional heavy/power metal songs that the band had in its repertoire and a name change to FORSAKEN was also in order. FORSAKEN's rise to its present stature as one of the globe's leading epic doom metal bands was eventful to say the least with the band recouping after losing guitarist and long-time friend Daniel Magri in 2001. After signing to Scotland's Golden Lake Productions in 2002, the band's fortunes took a turn for the better and several releases were to follow including "Dominaeon" in 2005, which is considered by connoisseurs in the scene as a landmark epic doom metal release. In his continual search to quench his desire for more doom metal, Albert formed NOMAD SON in 2006 - a band whose path to doom metal glory has been unrelenting and which together with FORSAKEN has helped define Malta has a bastion for true doom metal in Southern Europe. Sometime in 2011 Albert started working on the music for his solo project, later named ALBERT BELL'S SACRO SANCTUS. By autumn of 2012 he was able to present 2 demo songs to Metal On Metal Records with whom he'd been co-operating because of NOMAD SON. It wasn't what most would expect from the veteran of the doom scene... it was more of a return to the roots when it comes to his influences and musical career. And it was also the first time Albert's vocals were to be heard on a recording. This darker and much more "evil" sounding side of Albert's musical expression appealed right away to the label and the sides agreed to work with each other again. The debut album, "Deus Volt" was recorded during 2013 and 2014 at Chris Grech's (NOMAD SON guitarist) studio as well as at the renowned Temple Studios with sound engineering and music production guru David Vella. Albert handles most of the instrumentation on the album (vocals, lead and rhythm guitars, and bass of course) with Robert Spiteri - Malta's drumming prodigy from hard rockers FIRE recruited on drums to masterful effect. ALBERT BELL'S SACRO SANCTUS is the next step in Albert's heavy metal trajectory, where his song-writing, lyrical talents and musicianship all come to the fore. "Deus Volt" - Albert's debut solo album captures and pays tribute to the myriad influences that have inspired him to date - from the formative influences of BLACK SABBATH, JUDAS PRIEST, MOTORHEAD, VENOM and CELTIC FROST to Bell's passion and love for classic doom metal as epitomised by NEMESIS, CANDLEMASS, TROUBLE and SAINT VITUS. On "Deus Volt" one can also trace nods to epic metal and the dark, arcane soundscapes typical of the Italian and Hellenic metal scenes that Bell has always felt strong affinity to, reflective of the influences of Mediterranean culture on the music and thematic concepts that he has and continues to explore in his musical forays. 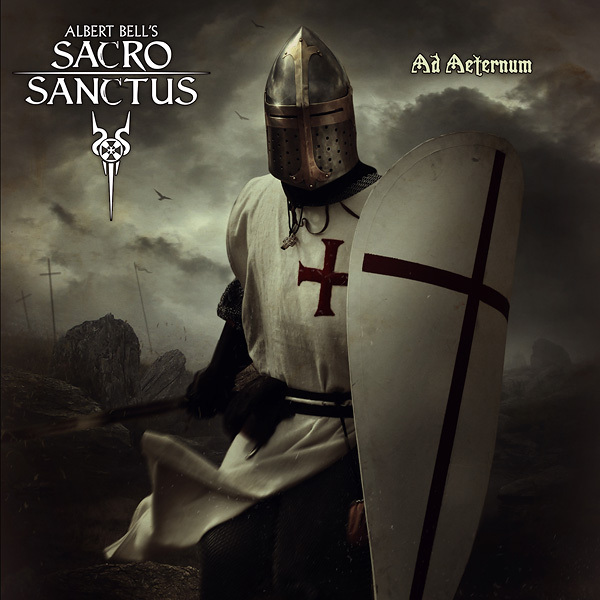 ALBERT BELL'S SACRO SANCTUS debut album was released on November 14th, 2014 through Metal on Metal Records. It brings savage epic blackened doom metal that you can raise your fist and headbang to! Primeval metal intended for the discerning and elite old-schoolers! Albert started working on his sophomore album still long before the debut was out. 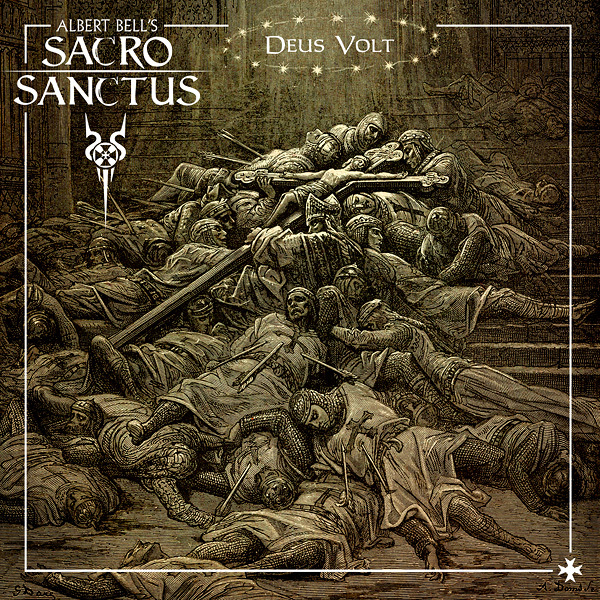 For the second SACRO SANCTUS album "Ad Aeternum", Albert uses the same musical and song-writing formula explored on "Deus Volt", though perhaps now somewhat more refined with his increasing studio experience as a solo artist. This said, Albert's approach remains steadfast and resolute in its commitment, dedication and celebration of old school metal, without any compromises whatsoever. Lyrically, "Ad Aeternum" revisits Templar history, combining fact, myth and fiction once more. After the Templars' rise to supremacy over the Saracen hordes, the Knights Templar continue on their primary quest in the Holy Land - to unravel the secrets of the Temple of Solomon. On this journey, the Knights Templar encounter, among other things, ancient Hermetic texts that spoke of a monolithic, all-encompassing God well before the origins and rise of Christendom. The Knights' interactions with Fatimid and Saracen traditions and lore also made them privy to other forces of esoteric and arcane knowledge, including the rudiments of ancient Sumerian/Babylonian magick. Armed with such arcana imperii, the Templars become even more invincible and a growing threat to the Papacy and theological orthodoxy - the very foundations of the Christian world are thus threatened. Steps are taken by the Papacy, cajoled by the French Monarchy (one of the principle power brokers at the time) to crush the Templars and destroy their influence throughout Europe. A brutal Templar inquisition is undertaken (this is where the album draws on historical fact) with the Order facing charges of witchcraft, demonology, devil worship and so forth. All this is documented on the track titled "Hex and Heresy". As referenced in the mid-section of the track, while the last Templar Grand Master de Molay is being burned at the stake, he and his associates curse their persecutors (Pope Clement and King Philip of France) who eventually die within a year of de Molay's torture and burning. Following the proclamations made by their Grand Master while burning at the pyre, the surviving Templars invoke dark Sumerian demi-gods and deities and unleash the foulest of deaths on their foes (as documented on both "Seal of Damnation" and "Invocations of Unlight"). Despite their persecution, many Templars survived and continued to wield untold power worldwide till this very day (hence the last track "Illuminati (Will to Power)" on the album - and the title track "Ad Aeternum"). Albert shall continue following up his forays into Templar history and myth with a third album, which will delve into the Templars' diaspora after their coerced disbanding and their links with contemporary esotericism and various secret societies. "Ad Aeternum" was again recorded at Chris Grech's studio, between July 2014 and August 2015, while drums were recorded by Robert Spiteri at the Temple Studios of David Vella, who contributed some keyboards and who again co-produced, mixed and mastered the album. Sparing no quarter, this gauntlet-clad fist in the face of all hipster pretenders and new metal trenders was released on April 29th, 2016 through Metal on Metal Records. Not resting on any laurels, Albert was soon busy writing and recording the third and final instalment in Sacro Sanctus' Knights Templar trilogy. Titled "Liber III: Codex Templarum", the album focuses on the Order of 13's fate following their coerced dissolution including their alleged involvement in insurrections against despotic rule in Scotland and the Alpine lands in the 14th century. Templar myth and fiction are combined to masterful effect once more as our erstwhile protagonist unleashes riff upon riff of untainted and feral old school, blackened heavy metal forged from a cauldron of pedigree influences from Celtic Frost to Trouble, to Motorhead, Bathory and Venom. With "Liber III: Codex Templarum", Sacro Sanctus continues to successfully tread along the true footprint of the genre with all its best ingredients meshed in a chalice of metalized blood that should satiate the thirst of elite metal aficionados. We find some changes in band personnel on "Liber III" - Steve Lombardo (well known in Malta for his pounding and malevolent drumming with local punk legends BNI plus his studio work with myriad Maltese bands) now joined on drums and Owen Grech (one the island's most talented shredders) on lead guitar. Owen (12TH ODE, MALTA DIO DISCIPLES) handles most of the guitar solo work on the album after being enrolled together with Steve and organ player Luciano Schembri on Sacro Sanctus cover of "The Shrine in the Gloom" - to be featured shortly in a Death SS tribute on Black Widow Records. Albert retained vocal, bass and all the rest of guitar duties together with his now tried and tested song writing and composition skills. All the pre-production work was completed between November 2017 and January 2018 at Steve Lombardo's Hell Next Door Studios (Gudja, Malta) while the album was mixed and mastered once more by Albert's erstwhile collaborator David Vella at Temple Studios, Mistra Bay, Malta. 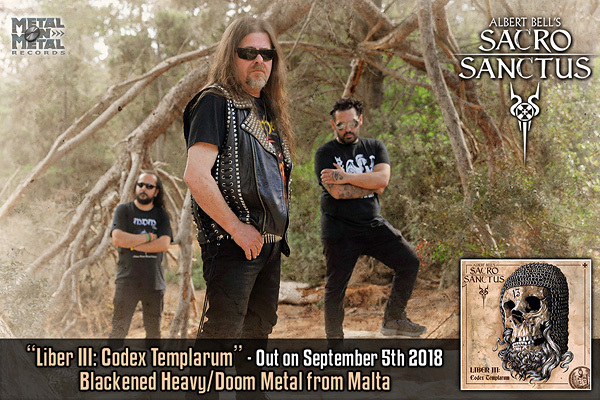 "Liber III: Codex Templarum" will be released on September 5th, 2018 by Metal on Metal Records. Raw and primal as you can get, Bell sounds the clarion of battle once more with his third declaration of war! Are you old school enough to handle it!? The sophomore opus from the Maltese metal-monger Albert Bell's SACRO SANCTUS offers no quarter, forging a unique style of old school epic and primeval blackened heavy/doom metal. Expect a barrage of savage riffs, sometimes more on the doom, other times on the thrash side, intended especially for the initiated in the arcane paths of olde. Bell conjures references from a rich tapestry of hallowed sources such as VENOM, ROOT, TÖRR, NEMESIS, CELTIC FROST, SABBAT (UK), ATOMKRAFT, ZEMIAL, MORTUARY DRAPE, BATHORY, ANCIENT RITES, Abbath's I or SAINT VITUS. He has also become much more confident as a vocalist, exploring various styles of expression. Lyrically, the album picks up where the debut left off, charting the last crusades, the Templars' discovery of ancient hermetic texts, their persecution and executions, the curse of de Molay, and the infiltration into several secret societies by the surviving ones. "Ad Aeternum" is a brute, gauntlet-clad fist in the face of all hipster pretenders and trenders. None shall be spared! Malta's most seasoned doom monger Albert Bell of FORSAKEN and NOMAD SON fame strikes with his first solo album (handling bass, guitar and vocals), that may surprise those who know him only from his epic and traditional doom bands. Here his darker and more extreme metal inspirations come to the fore: SACRO SANCTUS' debut brings arcane heavy doom, steeped in the primeval sounds and atmosphere of the early black/thrash metal. Imagine TÖRR, NEMESIS, later ZEMIAL, early CELTIC FROST, MORTUARY DRAPE, early DEATH SS and PAUL CHAIN, VARATHRON, VENOM, epic-era BATHORY and SAINT VITUS, all put in one cauldron. Lyrically, "Deus Volt" is a concept album, drawing from both myth and historical fact, and telling a compelling story about crusader incursions. It emanates from a mind that remains obsessed and entrenched in the path of olde, and is intended for the discerning and elite old schoolers. No sludge, no goth, no stoner, no post anything! Only doom with a heavy dose of true metal in its pristine hues!